To "play kikashi before defending" is an idea, derived from choshi, where if you must defend in an area in order to live, make good shape, or remove aji, it is usually correct to play kikashi in the area before doing so. May not be answered if played later (after defending). Give a local gain if answered. Black to move and save the stones. White does not follow the proverb here, since Wb is a good ko threat later (at this time, Black's descent at c is not a threat, since Wb is sente against the lower side). 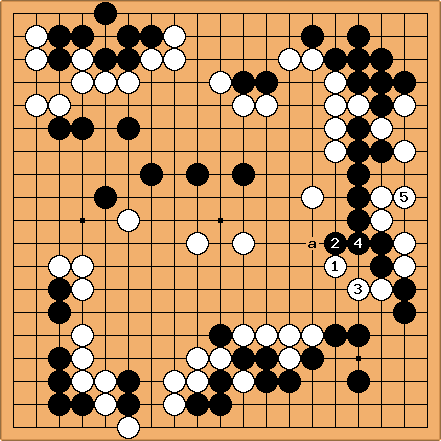 Failing to play kikashi first gives White too many options, even allowing him to follow the proverb himself to make good shape, for instance at and here. If the left side is not important now or later, White may ignore a later peep at a. 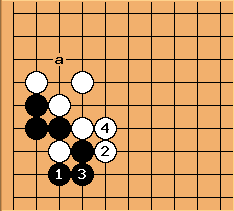 White (Takemiya) forces first with and before returning to live at - these two stones are useful moves that contribute to finishing off Takemiya's moyo on the lower side. 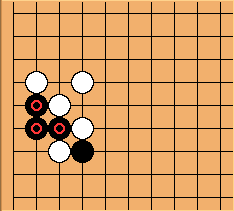 Dieter: Why did Black allow for a second forcing move with ? Couldn't he play at ? unkx80: Probably to apply pressure on the stone. 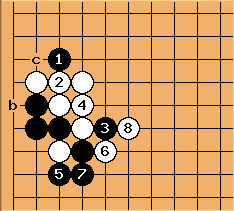 elfking: if 2 was played at 4 then white can play at 5, which becomes somewhat sente because afterwards if black plays tenuki the moyo formed by white playing at 2 or at a is quite big as far as I can see. 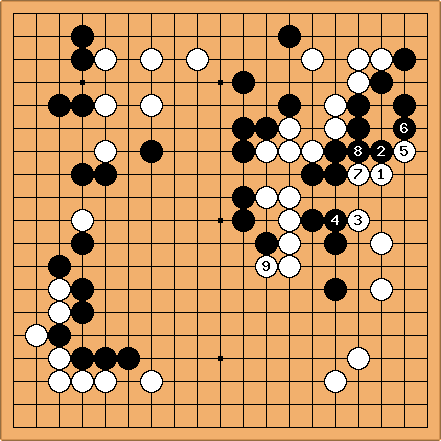 In a game vs. Yamashita Keigo in the 29th Meijin league, Cho Chikun plays kikashi with - before strengthening his center group with . (See commentary at http://www.asahi.com/igo/meijin29/16/05.html.) As it turns out here, despite the proverb about sacrificing kikashi stones, only happens to be in any danger! See PlayKikashiBeforeLiving/Discussion for old discussion. See PlayKikashiBeforeLiving/Old for previous content. See /Discussion for more recent discussion, now obsolete.